These projects reflect my past experiences managing products and teams. Previously Shop with Stella, Stunable is ready to revolutionize the way women experience fashion. Gone are the days of a hundred thumbnails per page, replaced instead by a simple and social recommendation interface. Check out the Stunable web site for more. 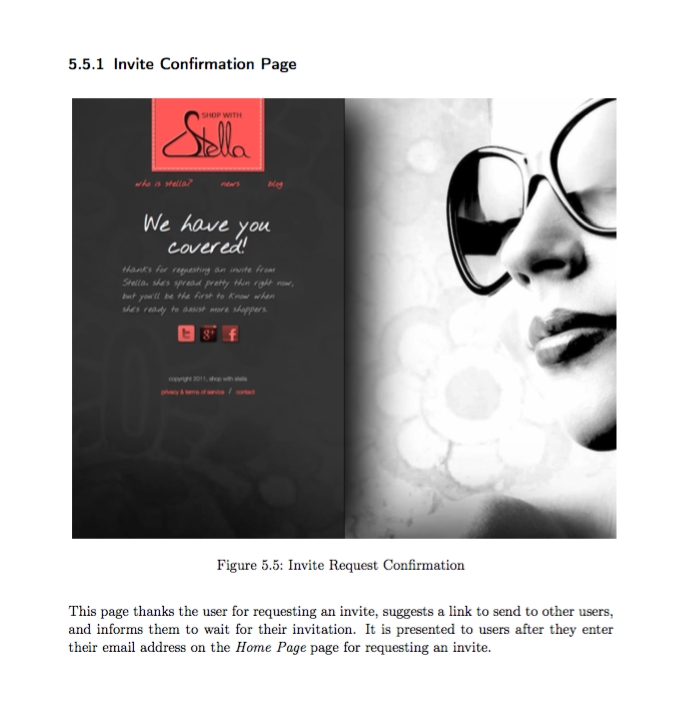 These are the design documents I put together for Stunable, then 'Shop with Stella'. They outline and design a full web app design for the concept, which I prototyped in Django over a couple of months. Once the graphical designs were in, they were used to substitute the wirefames in the draft versions to produce a complete spec that was provided to 3rd party developers for implementation. Part of the "Action Learning Program," a two month program that teams up Crown Prince International Scholarship students with delegates of major companies in Bahrain to work on a real challenge. The Action Learning team balances between improving the behaviour and skills of its members while producing results. This program began with a month long induction period that built leadership, management, and networking skills. After two months of research and work, this culminated in a proposal and report. This final presentation was presented multiple times, to members of all companies, including their board members and CEOs, as well as to the top 100 managers and board of directors of BAPCO. Current president of the SF Go Club. Established in 1935, the SF Go club is the oldest Go club in Northern California. Our mission is to share, teach, promote, and enjoy the game of Go together. I manage club events, the website, member lists, employees, etc... I'm constantly trying to improve the club offering and increase our popularity. Rivals of Vim users unite! Just kidding, we love you guys too. But seriously, Emacs is so awesome how could there not be a club? This Penn group holds lectures and hack sessions on all topics emacs. Definitely check out the meeting notes, they are engineer nerd gold. Botnet Atom Realtime Detector, an active distributed firewall whose primary purpose is to detect and protect against botnet attacks and infiltration. This is done by analyzing network flow information for patterns common to botnet behaviors and attacks, and uses a particular packet trait known as 'persistence'. This was a group-based project, and you can find lots more details in the design document.